Google Analytics is a FREE, must-have tool used by business-owners and online marketers to measure the performance of website campaigns and content while learning more about prospects and clients. With so many data points at your fingertips, it can be a challenge to focus on the most actionable items. 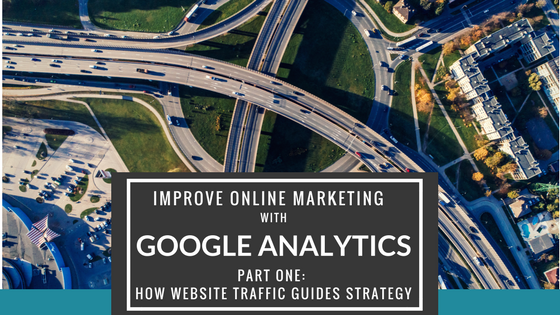 As the first installment of our upcoming series, Improve Online Marketing with Google Analytics, we’re going to show you how to analyze the changes in your website traffic, quickly and easily, but in-depth enough to inform changes to your digital marketing strategy. With small strategy adjustments, you can affect big change. If you haven’t dived into your Google analytics yet, we recommend you start with Google Analytics Basics to familiarize yourself with the interface and terms. On the left-hand menu, Audience -> Overview is one of the most beloved reports to view in Google Analytics. Business owners and marketers alike, especially when short on time, look at this page to see how much traffic their website is getting. The total number of site visits (sessions) can be a bit of a “vanity metric” as site visits in volume don’t always translate into business. However, when compared to the previous period or previous year, web traffic shifts can be a quick gauge of the effectiveness of recent marketing initiatives. So, what information from this data can be analyzed and translated into actionable items? “The goal is to turn data into information, and information into insight.” Carly Fiorina, former executive, president, and chair of Hewlett-Packard Co.
Start by comparing your web traffic numbers with other periods of time so you can see improvements and setbacks. Compare your audience overview to the previous period to see whether a recent digital campaign gave you a bump in traffic. Also, use this metric to determine if new marketing initiatives are bringing in the right traffic. If your business is seasonally affected, comparing your web traffic to the previous year would be a more accurate assessment of your digital marketing success during any time period. In either case, you’ll quickly see the data below the graph change to either green or red depending on whether it improved or not. When comparing traffic volume for informing digital marketing actions, it is best to look at Sessions and Users. If Sessions and Users have increased: Assess where the traffic increase is coming from by clicking Acquisition -> Overview. 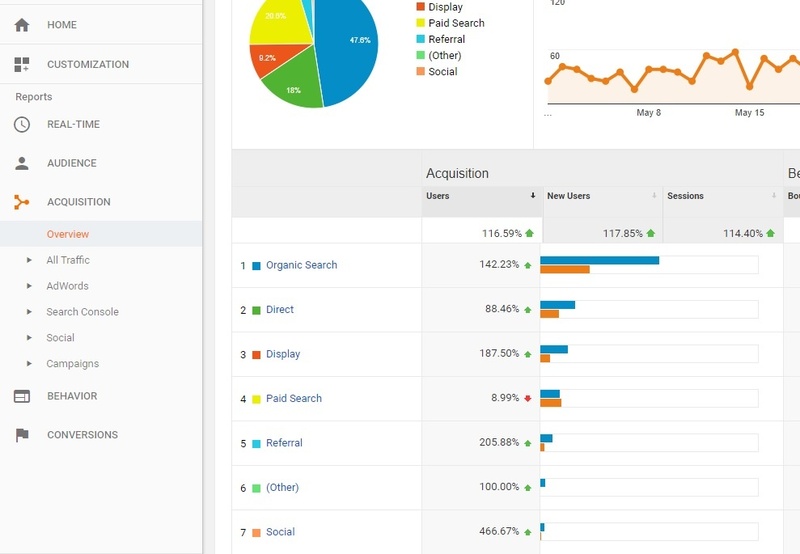 Without digging in too deeply but knowing what your recent activities were, you should be able to see quickly if it was a successful campaign (ads, social, or referrals), or the pay-off of consistent long-term content and SEO work (organic growth). Follow the largest increase to its source to identify potential ideas that can be maximized or duplicated for future success. For example, if your organic traffic is up 8% over the previous month click through the words organic search. Choose landing pages (I urge you to explore in analytics), and you may find a blog post from three months ago suddenly hit the nail on the head for a popular organic search. Or a web page you built last week spoke well to a group of prospects searching for that product. Whatever the case may be, Identify it. Duplicate it. If Sessions or Users have decreased: Follow a similar path as outlined above to find where the traffic loss occurred. In the Acquisition -> Overview menu, you can quickly identify the channel with the biggest loss, or more importantly, the loss that was most significant to you. Are all sources of traffic down? When all sources are down, this generally clues us into a seasonal shift when comparing month-to-month or week-to-week. But if you’re comparing year-to-year, this could be a red flag, unless there is a specific factor such as economic downturn or if your business relies on weather patterns. For instance, a lawn company can have an amazing May one year, but a dead May the next because it was particularly cold or rainy. If specific sources have fallen, then you need to look at changes made in that arena. You may have lowered your ad budget, so if you want more traffic, you know to bump that budget back up. However, you may have lost social or organic traffic, in which case you’ll need to dig in, find what page lost the organic traffic to see if your ranking for those keywords has fallen. Or check your social media marketing to see if a certain post was stale, or maybe you let up on your activity. In either case, it is imperative to make a note of where the loss was and make sure not to repeat that mistake. Remember: When assessing social media, if the posts performed at satisfactory levels, take a look at the posts from the time you are comparing. Sometimes an extremely successful post from last year can skew your comparison this year. This is also a good reminder of those posts that could be replicated. Sometimes a loss of total traffic is by design. I’ve shifted efforts for clients to focus more on sources of high-quality leads. Sometimes this change in effort equals a total traffic loss, but an increase in quality traffic and better leads. The moral of the story is, don’t just glow at your total web traffic growing and scowl at it shrinking. Take five minutes to dig into those changes, identify why the change occurred, and make sure your future actions duplicate successes and avoid failures. After all, as in all things business-related, online marketing is a moving target, and there is always more to learn. Stay tuned for more editions of Using Google Analytics to Improve Online Marketing.